Here is the instant recommendations on how to connect point-to-point fiber networks. 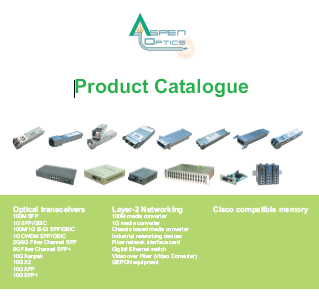 Welcome to Aspen Optics Ltd.
For more than 10 years Aspen has been providing trusted Optical Networking gear to customers globally. Long ago, we identified two trends in pluggable optics. First, switch vendors were charging ridiculous money for optics, cables and other bits and pieces for the network solutions they offered. Second, OEM vendors in Asia provided compatible hardware, but not with switch-tested and properly coded optics to meet the needs of mission critical telecom and enterprise datacenters. • Arriving at a price/performance ratio that makes sense to our clients’ budgets. • Providing technical and customer service quickly to any customer who purchases Aspen products or plans to. Aspen sells through a network of distribution partners as well as via online shop specifically catering to single project purchases for integrators and end-users where we currently do not have channel support. Additionally, if your company is interested in becoming a distribution partner, please get in touch with us directly (click HERE to contact us) and join our family of channel partners. For more information about our existing partners, please click HERE. We have many resources available on aspenoptics.com including a catalog, a configuration tool and data sheets. If you need assistance at any time please contact our team. We speak Mandarin, Cantonese, Japanese and everyone at Aspen is fluent in English.